Today, new Crisis Intervention Team (CIT) policies developed for the Cleveland Division of Police were released for public comment and feedback. The following organizations played a role in crafting the new policies: the Cleveland Division of Police, the Consent Decree Monitoring Team, the Department of Justice, the Mental Health Response Advisory Committee of the Alcohol, Drug Addiction and Mental Health Services (ADAMHS) Board of Cuyahoga County, and the United States Attorney’s Office. Mayor Frank G. Jackson and Chief of Police Calvin D. Williams welcome and encourage the public to participate in the feedback process. 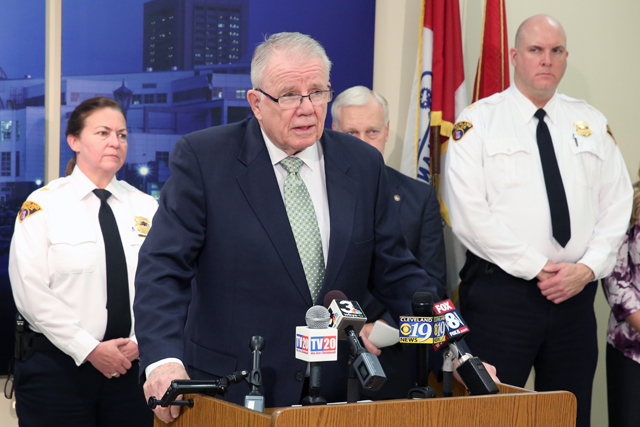 “These Crisis Intervention Team policies solidify our community’s goal of making Cleveland a city where everyone – including people living with mental illness and addiction – is treated safely with dignity and respect,” stated William M. Denihan, CEO of the ADAMHS Board of Cuyahoga County. Two public meetings have been scheduled to discuss the proposed policies. Both meetings will be held on December 13, 2016 at separate locations and times. The first public meeting is December 13th, 1:00 p.m. The second public meeting is December 13th, 6:00 p.m.
After public input is collected, the revised policies will be submitted to United States District Court Judge Solomon Oliver for final approval.